Cyperus esculentus which can simply be called “tiger nut” is one of nature's super foods, they are not necessarily nuts but they are tubers that generate beneath the soil’s surface. - Tiger nut is a very rich source of dietary fiber. - Milk derived from Tiger nut is a healthy alternative for cow milk which contains lactose intolerance. - Tiger nuts are rich in potassium, this ensures maintaining proper regulation of muscle contraction, digestive functions and to control the blood pressure levels. - Tiger nuts contain a reasonable amount of oleic acid, this helps increase your body HDL cholesterol. - Tiger nut milk is rich in monounsaturated fatty acids which make it an excellent anti-diabetic agent as monounsaturated fatty acids boosts glycemic tolerance. 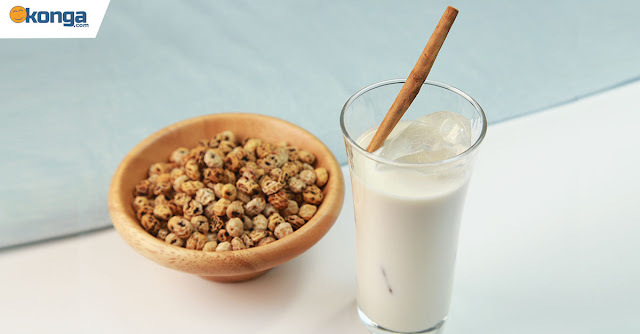 - Tiger nuts are used to treat stomach upsets, irritable bowels, and other digestive issues.